And so the official announcement from Crypton themselves! KAITO V3 will be released next Febuary. 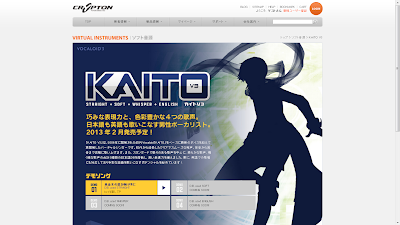 V3 Kaito silhouette can be seen in the website's layout. Also, the V3 KAITO has 4 voice banks, 「STRAIGHT」「SOFT」「WHISPER」「ENGLISH」. Crypton will be releasing the demo songs/voice bank one by one, for now, only the 「STRAIGHT」 voicebank is available. Do head to the link above to have a listen. Pre-orders for V3 Kaito will start on the 26th of December. I'll be updating this post once there's more demo songs! All demo songs have been released on the website!